The mirrorless interchangeable-lens camera market pioneered by Olympus with the PEN series is fast expanding in Japan and Asia where mirrorless cameras now account for 50% of the interchangeable lens camera market, as well as in Europe and the United States of America. Following up on the success of the OLYMPUS PEN Lite E-PL3, which wasand improved them, and combined them all in a compact, lightweight body. praised by critics for its combination of high functionality and ease of use in a stylish, ultra-compact body, Olympus has refined and improved on its formula with the new OLYMPUS PEN Lite E-PL5. Like its predecessor E-PL3, the E-PL5 is designed for people who want to enjoy the pleasures of high-end photography without crimping their lifestyle. At the same time, the E-PL5 boasts some pretty significant improvements in image quality, functionality and ease of use. The E-PL5 takes its imaging cues from Olympus' top-of-the-line flagship model, the OLYMPUS OM-D E-M5, by incorporating the same 16.05-megapixel Live MOS Sensor and TruePic VI image processing engine that have made the image quality and sensitivity of the OM-D E-M5 the unmatched standard for Micro Four Thirds system cameras. For style and design, the E-PL5 looks to the OLYMPUS PEN E-P3 for its convenient, stylish, and very functional detachable grip. Finally, from the E-PL3, it inherits the swiveling monitor that enables monitoring during self-portrait shooting with a greatly expanded swiveling range. In the E-PL5, Olympus has brought together the best from its entire lineup, refined and improved them, and combined them all in a compact, lightweight body. Exciting new features include the Touch AF Shutter function, which lets the user take a picture simply by touching the Live View screen. In combination with the FAST AF system that made the OM-D E-M5 the world's fastest autofocusing camera, digital photographers can now capture precisely the image they want at precisely the moment they want it. With instantaneous focusing and a capacitive touchscreen panel that reacts immediately to the lightest touch, the camera will not shake at the moment the shutter is released, assuring maximum clarity and stability. Incredibly effective with moving subjects, the Touch AF Shutter will make new ways of shooting possible, taking the creative power and excitement of photography to a whole new level. That looks like a great little camera. I wonder if any of the new Pens will have wifi? Some really interesting things about these new Pens. 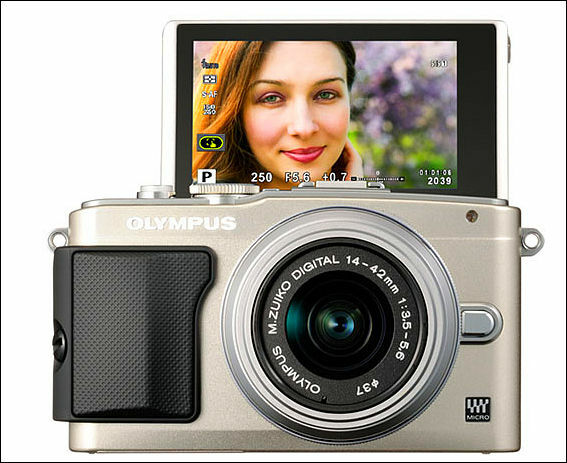 First the Olympus PEN EPL5 has 1080p @ 60 FPS AVC-HD video. That is a first for Olympus to have AVC-HD right? It also has 8 FPS continuous shooting. That is even better than GH3. OMD picture quality in a smaller package. Nice. But the design is neither retro nor modern. The Olympus PEN E-PL5 packs some serious photographic power into a small package -- thanks in large part to the 16-megapixel Live MOS sensor it borrows from the company's acclaimed OM-D E-M5. The image quality produced by a compact system camera at this price point is simply astounding. Though the E-PL5's menu system is confusing and confounding, those with patience will find themselves pleased with the camera's advanced, immensely customizable controls. Add to all this very fast and responsive shooting performance, and the Olympus E-PL5 emerges as a strong contender for enthusiasts looking to ditch their bulky DSLRs, as well as beginners stepping up into their first interchangeable lens camera. about 10 clips stabilized with Mercally. Most clips are out from camera, just little grading at Magic Bullet Looks. Same colors as EM5. People asking my advice about 5-AXIS (EM5, EM1) vs. 3-AXIS (EPL5, EM10). It not bad at all, but I see huge difference with EM5. I don't tried yet EM10, but I don't sure 3-AXIS IBIS of EM10 could be better than EPL5. If somebody think about cheaper camera than EM1, I'd better choose EM5 than EM10 for similar price. One thing I don't satisfied with EM5 is weak record video button, not really built for hard everyday use. Batteries of EPL5 hold about twice longer time than EM5, both original and replacing. First, thank you for being here and creating this site! Unfortunately, as soon as I connect an HDMI cable, the camera goes into playback mode. Is it possible to get around this? If not, can you recommend another micro 4/3 camera which I can use in this way? Perhaps the GX1, or something like that?